The academy software foundation is a new initiative by hollywood to advance open source software in the field of film making. Maybe you can get involved somehow and reap benefits? Thanks a lot, sfoster! I will look at this deeper! How can you work two jobs without being torn between the jobs and your family? People have been asking themselves that question for generations. And it's an unfortunate fact of software that once you stop actively supporting it then the software begins to die. Definitely one of the risks people consider if they're going to use open source software instead of industry software.. there is that chance that the open source will stop being supported. If your goal is a commercial product you could always try kickstarter to get going. If you goal is to keep it going you could always release it open source and let developers create forks, features, keep it up to date, etc. There's ways to make $ with open source, just ask google and wordpress. Finally, it happened! The mobile version now also has a card module! Dreams of lounging in bed and work with the cards now become a reality! 1. the cards themselves are located in a separate menu item, which is called "Cards"
4. the size of the cards, the distance between them, their geometry and the need to use the corkboard background can be set in the application settings. There appeared a separate section for setting up cards. I wish you all a good day, guys! 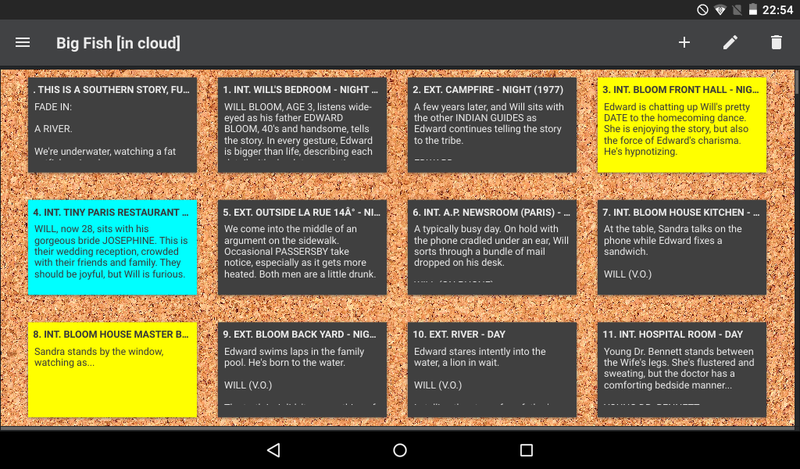 KIT Scenarist version 0.7.2 rc3 is coming! - fixed a problem with the fall of the program during the print preview. I think this will be the latest update for version 0.7.2 unless of course there are any very critical issues. And then we proceed to the development of the next version. Hello El Director, no, we create this version in partnership. - added German spelling dictionary.